NOTE: Today’s episode doesn’t sound as great as I’d like, or up to my normal audio standards. I’ll use surgery as my excuse. This horse collar doesn’t help much either. It sounds musical, but I promise you there’s nothing musical about it. 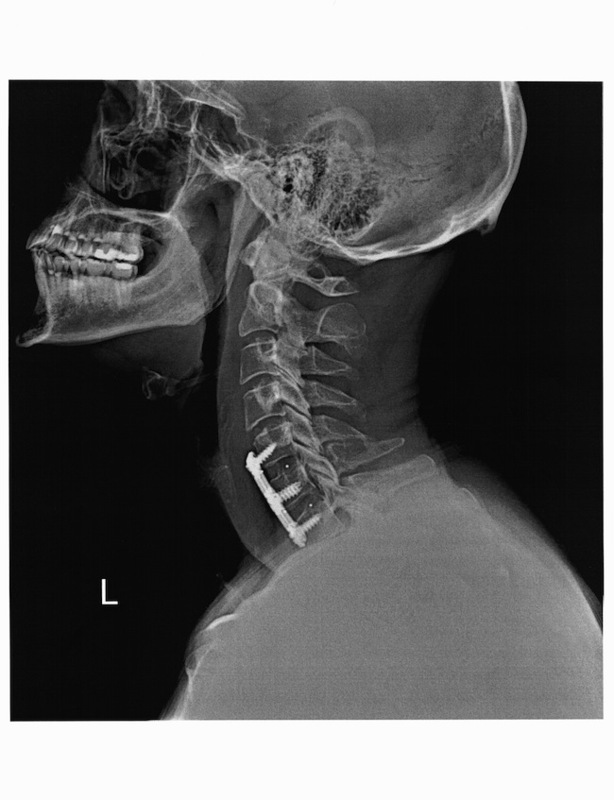 I think the technical term for it is ACDF: Anterior Cervical Discectomy and Fusion. The incision is in your neck. Yep, they go in from the front to work on your cervical spine. Scary? A little bit. Especially when in pre-op they send in the person who’ll be monitoring your spinal cord during the surgery. She was armed with a bunch of little wires and probes so during the surgery she can keep tabs on your spinal cord. That’s when you know this ain’t no rock ‘n roll show. It’s very serious business. I was first diagnosed about 10 years ago by the man who gave me scars, Dr. James Vincent Bonnet , MD. Dr. Bonnet had performed surgery on both elbows so when a bit of numbness hit my left little finger, he seems like the guy to go see. I trusted him. He suspected a bulging disc in my neck and sent me to a neurologist for a nerve conduction study. Off I went and sure enough, the doctor figured out I had what he deemed a “slight” bulging disc, just likely due to wear and tear, and age. The symptoms weren’t severe so I went through some physical therapy and in time the numbness went away. Fast forward about 7 years or more and Dr. Bonnet passed away. He was a good doctor and I liked him very much. In a way, whatever way a patient can love a doctor, I loved him. Back in February an old shoulder injury that occurred when I was 24 reared up its ugly head and hit me hard, bit me viciously and flung me around the room one night. Out of the blue. Over 33 years without any incident. No pain. No aches. No nothing. Then all of a sudden, I found myself in the ER (emergency room). Turns out the shoulder had very severe arthritis brought about by the injury years earlier. As a self-employed person I have health insurance, but I’ve got an insanely high deductible. For those of you who aren’t in America, I can tell you that it doesn’t take long to go through money when you need health care here. Obamacare, in my opinion, is a colossal failure and will do nothing but wreck an already broken system. But that’s another story. My story involves forking over $10,000 out of my own pocket before insurance kicks in. That prompts me to approach my new shoulder orthopedic surgeon, Dr. Bing Tsay (pronounced Cy). Sing to me, Bing! And he did. He told me he really couldn’t explain the severity of my shoulder pain. Since I had hit my deductible I went in to see him one day and asked, “Is there any reason I shouldn’t just get this taken care of now?” That got me what’s called Open Mumford surgery. This surgery went well. Dr. Tsay found a shoulder a lot worse than the MRI might indicate. Lots of bone spurs and arthritis. He even fished out a lose bone fragment. Within days I was pretty much experiencing full range of motion and things he told me might take weeks. I’ve almost always done extremely well with surgery (during and after). I don’t even do too badly before either. At my final visit with the Bing, I bring up this 10 year old neck issue and ask about seeing a colleague, Dr. Timon (pronounced short i, long o – Te-mon’). Dr. Timon did back surgery on my daughter some years ago due to a car wreck she suffered through. She really liked him and he was a colleague of Dr. Tsay. In fact, it was my daughter’s recommendation that even led me to All Star Orthopedic in the first place. That’s Dr. Timon and Dr. Tsay, second and third from the left when you land on their home page. They’re different, but I like them both. Of course, you have to keep in mind that I seem to have a man crush on orthopedic surgeons. I’ve now had four of them in my life and they are all the men who have given me scars. Scars intended to heal me and make me better. Mostly, they’ve succeeded. So now I’m sitting in front of Dr. Timon. Most doctors try a conservative approach first. In my gut I knew that approach wasn’t likely going to work because I’ve suffered this neck stuff for 10 years plus. No matter, I went with Dr. Timon’s advice. We tried all the conservative things, but nothing touched it. Nothing. Finally, I had the same talk with him that I had had with Dr. Tsay, “Any reason to not fix this now?” He replied, “No, not really. It’s not going to get better on its own.” That’s when I sat down with the person in their office who schedules surgery. Lest you think that orthopedic surgeons are godlike with no need to get help from the little people, you’d be wrong. There’s a gal in the All Star Ortho office, the scheduler, who does a very good job. You know I’m fanatical about customer (in this case, patient) experience. Her name is LaDonna. She’s crazy good. Office staffs can sometimes become surly and who can blame them. Dealing all day with people who likely don’t feel very well must take a heavy toll on people. I wouldn’t want to do it. I’m a pretty good patient, likely the result of years of experience in dealing with the public and lots of people. The last thing I want to do is cause somebody unnecessary grief. BUT…once in awhile you run into a remarkable person like LaDonna. Somebody who extends themselves to be helpful. Somebody who just performs at a higher rate than most. That’s been LaDonna. LaDonna helps me through the maze of insurance issues and scheduling conveniences. We finally hit on Monday, August 4th at 8:45AM. Done. Book it. We arrive at the private hospital in Dallas at 6:30AM. By 7:30AM I’m in pre-op watching a person untangle lots of little wires that will monitor my spinal cord. If memory serves well (and it may not given I was in surgery), by 10AM it was over. Dr. Timon told Rhonda it was worse than the MRI showed. “So he wasn’t being a wimp?” asked Rhonda. “Nope,” replied Dr. Timon. He removed the damage between C5 and C6 and also between C6 and C7. In place of that damage he inserted some cage with bone taken from my left hip. You can Google it and find some pretty disgusting pictures, video and diagrams. I’d rather not look at those right now! Or post them here. A plate with 6 holes (for 6 screws; 2 each in C5, C6 and C7) is placed across all three vertebrae. That makes sure it’s stable from here on out. Hopefully. The pain wasn’t really pain. It was mostly discomfort. And it was mostly all across my shoulders. “Typical and to be expected,” said the nurses. But worse than that, a raging soar throat. Again, to be expected said all the nurses. No pain meds were necessary. I was up walking the hall within an hour. And I walked. And walked. And walked. And walked some more. All whist eating ice. Lots of ice eating. I eat a lot of ice anyway, but I wasn’t even pacing myself after surgery. I was an ice eating machine. It kept my throat feeling better. Nothing helped my shoulder pain. I chalked up the shoulder pain to muscles straining because of the surgery, incision and all the adjustments a body must make during trauma. Not until Dr. Timon’s PA, Michelle entered did I find out the real reason for all the shoulder pain – being cinched down to the table during surgery so I wouldn’t move. Duh. That made perfect sense and I felt stupid for not thinking that when surgery involves your spinal cord – or proximity to it – you can’t move at all. Michelle, like all the folks I’ve encountered at All Star Ortho, is another remarkable service provider. She came to release me from the hospital. She was also the one who went through the extensive pre-surgery education with me in Dr. Timon’s office some days prior to the surgery. Today it’s Wednesday. It’s about 8:30Am. My calves are ridiculously sore. Nobody told me, but I can tell it’s from being pinned down to the table. I’m walking like an old man on my heels. Well, I am an old man back on his heels. But Lord willing, I’ll be back on my toes in no time. I can’t shower for 4 days. I can’t drive for 2 weeks. No aspirin or blood thinning pain killers for 6 months. My next in office visit is August 18th with Dr. Timon. I don’t anticipate any hurdles. I just have to keep fighting the fight. Gotta keep moving and work out the kinks and soreness. Isn’t that what we’ve got to do in life? Keep moving and grinding it out? I’m still working through this. Honestly, I’m not sure what I want to do…except I want the podcast to mirror the work I do. The work I do is pretty diverse. That’s my current dilemma. I do many different things to help executives and businesses excel. It doesn’t all fall under coaching. Nor does it all fall under consulting. It’s almost always a mixture of the two, but sometimes it’s clearly just one or the other. That’s making it hard for me to figure out. Higher Human Performance still is the best depiction of it, but I don’t know if that’s strong enough for marketing purposes. A weekly podcast. That’s still what I want to produce here. And I’m still pretty stuck on making it a 30 minute (give or take) format. I’d like to release the shows on Tuesdays or Thursdays, but I can’t tell you why really. Well, other than the fact that I find myself downloading mostly on those days. I have no empirical evidence to support Tuesday or Thursday release dates. I should likely do some research. I’m sure Libsyn and others have some data about which days are typically best. I’m open to test it, too. While I’d love to investigate a partner to banter with, I don’t think I’m going to dive into that murky water. It’s too dangerous. Chemistry is either there or not. And I’ve lived long enough to know rare it is in the real-world to have great chemistry with somebody who gets it, gets you and somebody you get. Insert recording into the process and that can change things, too. I don’t want to risk it. Besides, for over 7 or 8 years I’ve done this stuff all alone so it’d likely be tough to change it now. As for cover art and logo stuff…well, when you have no show title yet, those things will have to wait. First, I need a great show summary. Something that properly describes the content. Then I need a great title. After that I can worry about cover art. I’m going to move Saturday’s Smile and Freeform Friday over to LeaningTowardWisdom.com, my other site and podcast. Those two features just seem more congruent over there. I’m sure people look at those things with bewilderment. And posts just like this one will now appear at LeaningTowardWisdom, not here. For instance, that post about the man who gave me scars would have likely been better at LTW (Leaning Toward Wisdom) than here. I’m planning to keep things here more professional. The personal stuff will all be over at LTW. I’m not going to remove all the history from BulaNetwork and migrate it to LTW. I’m just drawing a line in the sand today by starting a new habit over at LTW. So starting this Saturday, you’ll have to visit LTW to find Saturday’s Smile. Of course, you can always follow my Pinterest account and see them. Free Form Friday is a special episode I record on the last Friday of each month. That’s been a feature here at Bula Network, but I’m going to move that to LTW, too. All those changes are pretty easy to make. Bula Network, LLC is the business name so it makes sense to keep the business stuff here and move the other stuff over to LTW. So far, that’s it. That’s all I’ve decided. I’d love to hear your thoughts about it. Use that contact page and let me know.